Ted Cheeseman clashes with undefeated Spaniard Sergio Garcia for the EBU European Super-Welterweight crown at The O2 in London on February 2, live on Sky Sports in the UK and DAZN in the US. ‘The Big Cheese’ gets his European title shot after outpointing Asinia Byfield in an all-action battle for the Lonsdale belt at the Copper Box Arena in October, and the Bermondsey favourite knows a win over Garcia could secure a mouth-watering fight with Liverpool’s Anthony Fowler. Bitter Light-Heavyweight rivals Jake Ball and Craig Richards finally get in on after Ball pulled out of their October meeting at short notice due to injury, and there is no love lost between the pair who have been trading insults over Twitter ever since. Felix Cash won his first professional title in October and now he gets the chance to add a second when he takes on Nigeria’s Abolaji Rasheed for the vacant Commonwealth Middleweight title, with the Wokingham man determined to make up for lost time. Undefeated British and Commonwealth Cruiserweight Champion Lawrence Okolie returns to action after wrestling the Lonsdale belt from Matty Askin at Wembley Stadium, and the Hackney powerhouse is aiming to add more belts to his collection in 2019. Further exciting additions to the card will be announced soon. 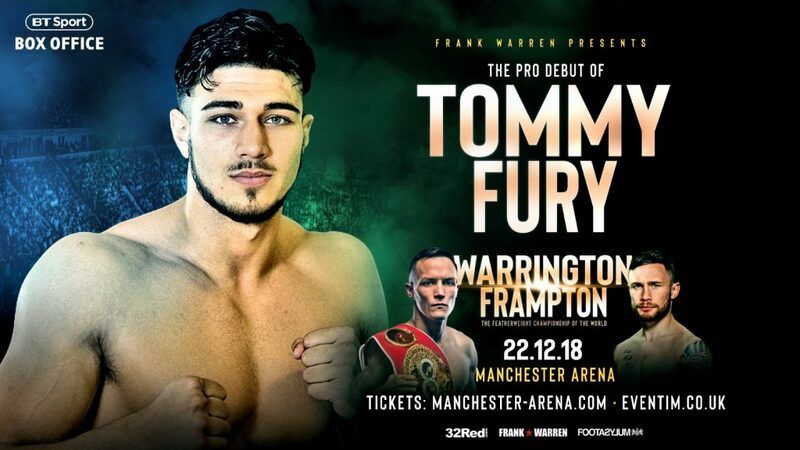 IT TOOK JUST 12 amateur fights for Tommy Fury to reach the conclusion that following in the family footsteps was the direction for him to travel. The younger brother of lineal world heavyweight champion Tyson makes his professional debut on Saturday night at the Manchester Arena at the age of just 19. Fury has been patiently learning his trade over the last year, developing his skills first in the gym of Pat Barrett and now with Ricky Hatton at the Hyde base used by Tyson when training in the UK. He should be well prepared for all eventualities in the professional game, given that he has been right in the thick of training camps involving Tyson and cousin Hughie over the years and has seen first-hand what it takes to reach the very top. However, it still seems to have taken a little while for the youngest fighting Fury to branch out and forge his own path in the toughest sport of all. “I don’t know about you, but it definitely has for me and I have been training all year – training very hard as well,” reported the light heavyweight, who will feature on the BT Box Office blockbuster card in Manchester in support of the IBF world featherweight title showdown between Josh Warrington and Carl Frampton. “I just think it has come at the right time and I couldn’t be on a better show, so it has been worth the wait. An extended stint in the amateur code was not to the taste of Fury, who indicated that a lack of vested interest pushed him towards the pros. “I had 12 amateur fights and won the North West title twice and then I went to the nationals and got to the final of that. In my last fight I boxed a kid who had the British title belt and I boxed him in Yorkshire for it and never got it. “I beat him on a unanimous and thought, I’ve had 12 and know what it is about, if you can fight you can fight and there was no point hanging around because it is two completely different sports. “Just because you are a good amateur doesn’t mean you will make a good pro. “I didn’t like it at all, with those headguards on and the big gloves. It was not for me at all, point scoring and it is like a game of tig really. In the professionals, especially if you carry power, you need to sit down on your shots. “In three rounds you can’t really do that,” he added, pointing out that now is the time for his turn in the spotlight. “Looking back at it now over the years when Tyson and Hughie have been training. They’ve been getting all the coverage, doing the media workouts and doing the fighting – now it is my turn. “Everyone has seen me lurking in the background for years wondering if I would ever get my shot. Now it has come I’ve got to look forward to the moment, but it has come and I am going to take it with both hands because these opportunities don’t come along all the time. Eddie Hearn: “There’s a great narrative for this and we didn’t necessarily need it. The first fight was one of the best 12 rounds of action we have ever seen. “Here we go again. One of the great fights we’ve seen in recent years – two years ago between Dillian Whyte and Derek Chisora, it had to happen again. “A lot of change has happened in those two years. Both of them are coming off terrific victories in the summer on a wonderful night at The O2. “Derek has had opportunities in the past but hasn’t capitalised. Experience tells him that he needs to work hard, and sacrifice. “When he stands on the scales tomorrow, you will see the difference. I have felt his power and presence and ferocity in the ring. “He realises a performance like he produced two years ago won’t be good enough to beat the 2018 version of Whyte. The heat brought to Dillian will put him in an uncomfortable zone. “He will be let off the leash to do some serious damage. I like the energy and intensity of both fighters. Both teams believe they will win this, but I’m glad to be on team Chisora. “Derek is like a stream train going full steam ahead. This fight can only be better than last time, they’re both fitter and faster. “It’s got everything to be another fight of the year.” Dillian Whyte – Brixton, London – 24-1, 17 KO’s – defending his WBC Silver and WBO International Heavyweight titles against Derek Chisora: “He won’t be pounding me, there’s levels to this thing. I’m used to people trying to get into my head. I don’t think even Derek himself knows what he is doing. “I’ve had good learning fights and there’s still a lot more to come – I’ll fight anybody. I’ll do whatever it takes to get the win, I conserve my energy, I’m relaxed. “I am born again. I gave my life to the Lord. By doing that, I became a better person. My good friend David put me through my paces. “I’ve rebuilt and come back. I’m in a great place. It’s going to be a seek and destroy mission on Saturday. Our game-plan is to bite the gum shield, seek and destroy. “Training camp has gone remarkably well. When different teams get together it’s always a gamble, but I can honestly say that it’s gone really well. “This is a huge fight for me. It was a big lesson against Doyle. It’s not going to be an easy fight but the styles will gel and I’m going in confident. 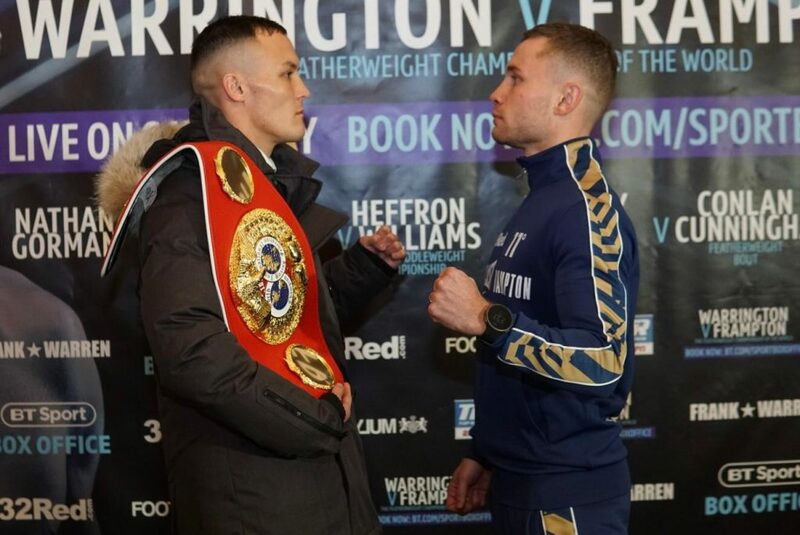 The final press conference took place today ahead of Josh Warrington’s (27-0) IBF world featherweight title defence against Carl Frampton (26-1) at Manchester Arena on Saturday night (22nd December) live on BT Sport Box Office. Also on the bill Mark Heffron (21-0) and Liam Williams (18-2-1) meet for the vacant British middleweight crown, Martin Murray risks his WBC silver middleweight title against former WBA champion Hassan N’Dam, unbeaten heavyweight Nathan Gorman (14-0) defends his WBC international silver belt against Razvan Cojanu (16-4) and Belfast’s Michael Conlan (9-0) fights in England in the first time and meets Jason Cunningham (24-5) Making his debut on the bill will be the younger brother of Tyson Fury, a 19-year-old light-heavyweight. Here are a selection of quotes from today’s conference. JOSH WARRINGTON “Carl has seen his a*se a bit with some stuff I have read but there are tensions when the fight gets close. I have been preparing for Carl at his prime and that excites me to graft my backside off. I have gained confidence and momentum from beating Lee Selby and I will find new levels this weekend. People say I should have had a steady defence, but I want the best and after this I’ll go to the States and fight Oscar Valdez. CARL FRAMPTON “I’m excited, relaxed and looking forward to a good tough fight. My nature is laid back and I will be until the ring walk. There is an edge and tension as it gets closer, but there is respect between us. I got a text message from a good friend and he said’ ‘total respect, but no fear’ and that is what this is. I believe I am better than ever because I was beating Leo Santa Cruz and Scott Quigg when I wasn’t enjoying boxing. I believe he is a very good fighter, but I beat any featherweight in the world on my day. The ambition is there more than ever because I have been written off. The fire is burning in me and people will see in a dog fight that I am not over the hill. RAZVAN COJANU “Nathan is a different style to Daniel Dubois who I was due to fight last week. I have advantages over Nathan like my reach. I was a big fan of Nathan’s trainer Ricky Hatton so I better watch for the body shots. If I do what we’ve been doing in the gym we’ll be flying. MICHAEL CONLAN “Jason is tough, had experience, won two Commonwealth titles, but it is nothing I haven’t seen before. I have faced plenty of southpaws, know how to face them and I haven’t taken him lightly. I would love him to take me to the trenches and if he does, game over. JASON CUNNINGHAM “I am excited by this opportunity and I didn’t think twice to take this fight. I respect Michael’s amateur achievements and if he is the real deal we’ll take him to the trenches. There is no pressure and I am just enjoying the moment. TOMMY FURY “I am blessed to be in this position and know I wouldn’t be here without Tyson, but these opportunities I have to take with both hands. Tyson has been to the pit of hell and come back to the top of the hill. The world knows he is the real WBC world heavyweight champion. I have the Fury name, and that brings pressure but I have learned to live with it. I’m trying to do my own thing. If I achieve half of what Tyson has done I’ll be pleased because he is the greatest fighting man I’ve ever seen. The pair clash for Buatsi’s WBA International title at The O2 in London this Saturday, live on Sky Sports Box Office in the UK and Showtime in the US, and Quinlan is looking to halt the Croydon talent’s rapid rise in its tracks. 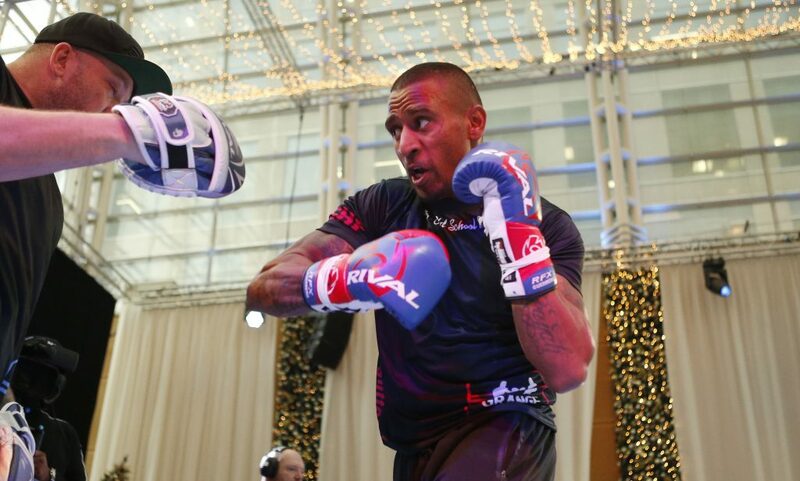 “It’s another big opportunity to fight for a meaningful title, back in the UK,” said Quinlan. “It’s a big challenge and that’s what gets my juices racing. I don’t intend to let the chance slip. “I tend not to study opponents so I don’t know much about Buatsi. I’ve heard he won an Olympic bronze medal and they don’t give those away so he must be capable. The three blotches on Quinlan’s CV came against credible company. 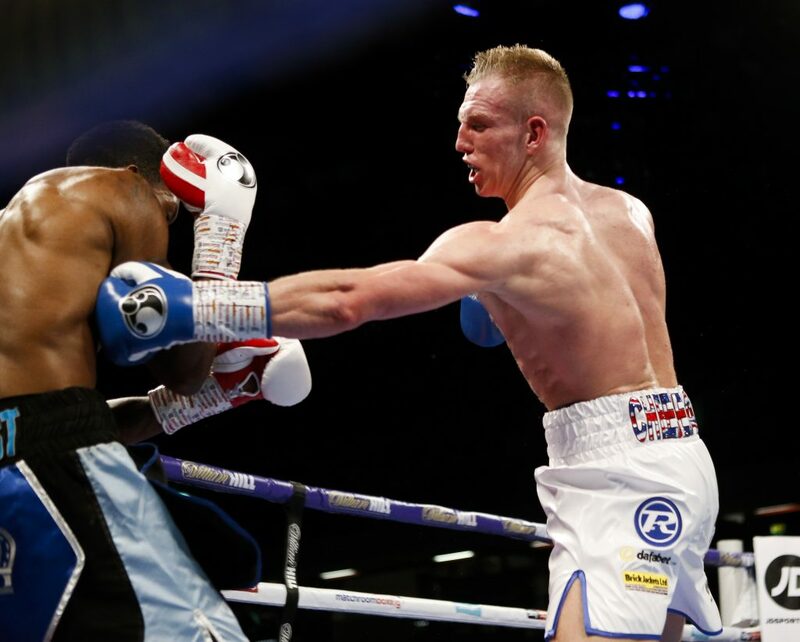 Victoria’s unbeaten Jake Carr edged past him on a close decision in a 2014 Australian Super-Middle scrap and Brighton’s Chris Eubank Jr relieved him of his IBO crown by tenth round decision in his only prior visit to the UK in February last year. In his first fight at 175lbs last April, Quinlan conceded to Queensland’s 13-1 Damien Hooper in round nine, but only after he had clubbed the 2012 London Olympic quarter-finalist to the canvas twice in round five. “I’ve learnt a lot from those defeats,” said Quinlan. “I felt I was a bit unlucky with the decision against Carr. It was very close but he has a very high work rate and was the defending champion. I was going through a lot mentally, outside the ring at the time. “The late stoppage defeat to Eubank taught me what elite athletes need to do to succeed. Physically I was right but I wasn’t mentally focussed. I was on a fast food diet and just tried to run the weight off. Main event sees fierce Heavyweight rivals Dillian Whyte and Derek Chisora rematch after their Fight of the Year contender in December 2016. Charlie Edwards gets a second shot at a World title when he challenges Cristofer Rosales for the WBC Flyweight World title, David Price and Tom Little meet in a must win Heavyweight clash for both men,British Featherweight Champion Ryan Walsh puts his Lonsdale belt on the line against Watford’s Reece Bellotti,with Ipswich Heavyweight Fabio Wardley andNigerianMiddleweight Linus Udofia also featuring on the undercard. 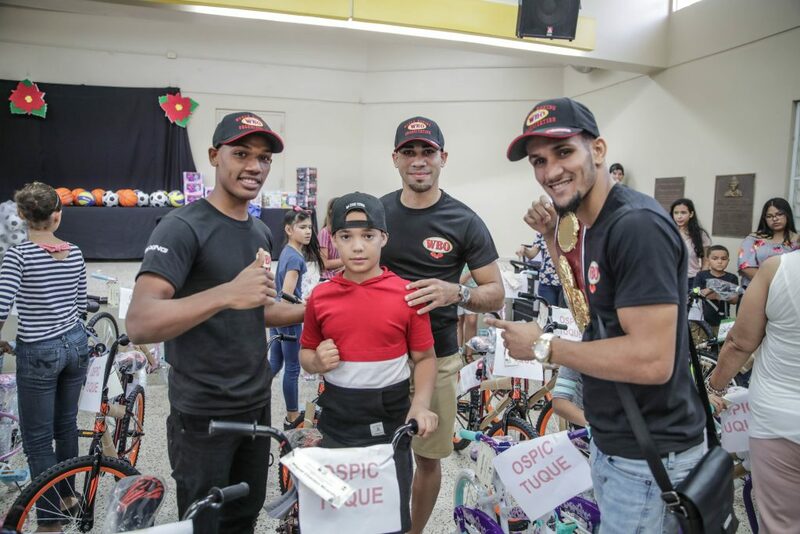 PONCE, Puerto Rico – In an emotional and busy Christmas activity, the World Boxing Organization (WBO) and its president Francisco “Paco” Valcárcel, accompanied by former world champions, prospects, WBO World Jr. Flyweight Champion Ángel Acosta, regional champions, and other figures of the sport were delivering gifts to children at the Sor Isolina Ferré Center in Ponce, as part of the successful world ‘WBO Kids Drug Free’ program. An emotional Sister Mildred Vázquez, Spiritual Director of the centers of Puerto Rico, said: “The WBO and Paco Valcárcel have been committed to us for around 20 years. There are many gifts that will be distributed to the other centers that we have in Puerto Rico. Since day one, which was a long time ago, I remember that Paco told us that the WBO was never going to forget us. His deed is very important for all of us. We will never forget the great help you gave us then Hurricane María hit us hard; we are very grateful”. “Respect for the school, respect for the church, respect for their fathers and mothers, respect for the elderly and respect for their peers. Respect is the most important priority in life said our Savior”, Valcárcel expressed to the large number of children present. “Sister Sor Isolina always knew how to multiply the fish and bread. She was sent from God. They can count on us every year, the commitment will continue, and we love them very much”. The world champion Ángel “Tito” Acosta said: “Many children left happy with their gifts and bicycles. I always tell the youth that they have to get away from the streets to concentrate on their studies”. Participating in the activity were Acosta, former professional basketball player Javier “Toñito” Colón, WBO Latino Featherweight Champion Luis “Popeye” Lebrón, WBO Interim Latino Heavyweight Champion Víctor Bisbal, the former world champions Samuel Serrano, Alex “El Nene” Sánchez and Ángel “Cholo” Espada, along with boxers Alfredo “El Salsero” Cruz, Jean M. Rivera, Edwin “Chin” Valentín, and amateur boxer Bryan Rodríguez. Also in the event were boxing managers Margaro Cruz, coaches Jesús “Tongui” Ortiz, Ángel Vargas, Yoel “Yowy” González, and Félix Pagán Pintor, referees José Hiram Rivera and Ramón Peña; professional boxing judge César Ramos. For the WBO, other than Valcárcel, legal advisor Gustavo Olivieri, WBO Treasurer Adolfo Flores, and WBO Chairman Ratings Committee Edgardo López Sasso were also present. WBO Kids Drug Free is an international program aimed at children and young people in order to carry a message of prevention to the use of drugs and to motivate them to continue studying, using sports as a tool to stay on good steps, as well supporting causes aimed at those in need in order to contribute to a better quality of life. Tom Little says he is mentally tougher than David Price and is planning on taking the Liverpudlian giant to ‘deep and dark places’ to get the win. 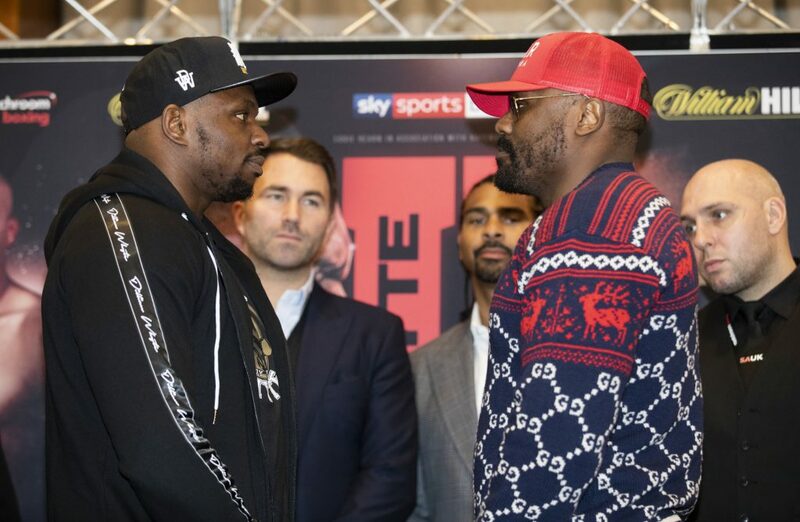 Little and Price clash on the undercard of Dillian Whyte’s eagerly-anticipated rematch with Derek Chisora at The O2 in London this Saturday, live on Sky Sports Box Office in the UK. Like Little, Price has suffered back-to-back defeats in 2018. He was brutally stopped by Alexander Povetkin after initially flooring the Russian last March and then a fight against Sergey Kuzmin in September was cut short when Price suffered an injury. Little believes Price is vulnerable and plans on taking full advantage when they meet over eight rounds. “I’m mentally stronger than David,” said Little. “He’s going to let his last couple of defeats get to him whereas I’m just eager to put them behind me and move on. I’m willing to go to them deep and dark places to get the win. “David has the skill-set and the physique to stand me on my head,” added Little. “But I’ve got a heart bigger than David’s. There will never be any quit in me. Who wants it more? That’s the difference between me and him. I am willing to go to places that David has nightmares about. A shot at a title could be the reward for Little if he upsets the odds against Price on Saturday but he also knows the ramifications for the loser of the fight. “This is a game of hearts, and you have to put it on the line. Sometimes you have to bite down and go to lace that you don’t want to go. I’ve done that a couple of times. It ain’t all roses, honey and cuddles in the trenches. You have to fight your way out. Charlie Edwards gets a second shot at a World title when he challenges Cristofer Rosales for the WBC Flyweight World title, rising Croydon star Joshua Buatsi defends his WBA International Light-Heavyweight title against tough Australian Renold Quinlan,British Featherweight Champion Ryan Walsh puts his Lonsdale belt on the line against Watford’s Reece Bellotti,with Ipswich Heavyweight Fabio Wardley andNigerianMiddleweight Linus Udofia also featuring on the undercard. 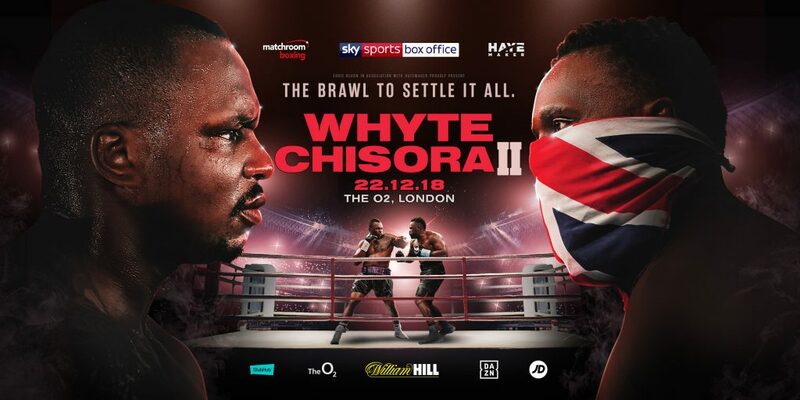 London (18 December 2018) Bitter British heavyweight rivals Dillian Whyte and Derek Chisora collide in one of the most eagerly awaited rematches in recent years at The O2 in London on December 22, exclusively live in the UK on Sky Sports Box Office and on DAZN in the US. The charismatic, unpredictable, but exciting Chisora spoke candidly with Love Island 2018 runner-up Josh Denzel and gave an interesting insight on a number of points around the big-fight this Saturday night. The first fight was a great fight but they gave it to him, and I was like, why? because I did more work than this guy and they gave it to him because he’s the home fighter. I kept on saying, I want the rematch, I want the rematch, and they didn’t want to give it to me and they were pushing Dillian towards AJ, and then suddenly people kept saying they want the rematch, so they gave it to me. I joined up with the Hayemaker and he said listen, this is how champions train if you want to be a champion you have to do this work right now and then afterwards you can enjoy the victory. I got Don my trainer to give me his number, I called him, he didn’t answer, he didn’t answer because he didn’t have my number. I sent him a message, it’s DC, can you call me me, and then after I called him he answered, I said I’m going to come and see you, it’s Dereck Chisora, “Ahh Cool, come meet me at the Park Plaza,” I met him there and had a chat. When I had the argument with David and then the fight, we had the fight and he won and that was it, there was nothing else to talk about, he’s won the fight fair and square so, like, that’s it. And there’s a bit of banter sometimes when I see him, like, I don’t like you’re cane rows…he rocks them nice though! “When I sat down with him, I said listen, I’ve changed so many things in my life I need a great manager, somebody who can help me achieve that next step, and he looked at me and he’s goes, “If I’m going to do it, I want to do it 100% percent for you.”. I lost the fight in Monaco which I was not supposed to lose and then, as I was giving my interview, something said, you know what?, you just need to give yourself to the Lord. It’s made me a better person. Like the big man, Tyson (Fury), himself, you listen to his interviews, all I heard him say is “praise God, praise God,” because he went and believed that little bit of Jesus which helped him to come back as a great fighter he is. Yes I am, listen, when we get in the ring, people are going realise, WOW! It’s going to be amazing! I was fat kid, went to Finchley to box, plus I was under probation for three years, actually the Metropolitan Police paid for my boxing class, they bought my first boxing boot, boxing gloves, headguard, gumshield, everything! I would just tell him, listen, just be careful out there and make the right decisions. When you’re 16 people tell you “don’t do that” because they were 16 before…when you’re 16 make the right decisions. I’m going to leave the ring, go home, and attack that Christmas Turkey! It’s my birthday on 29th December…plus it’s my wife’s birthday! I’m going to go to war. I hope he’s ready to go where I’m ready to go. If he’s not, he’s stupid. I’m coming. Hunt him down, just go hit him, hit him, just hit him, hit him and hit and hit and hit and pounce and pounce, pounce, pounce, pounce! 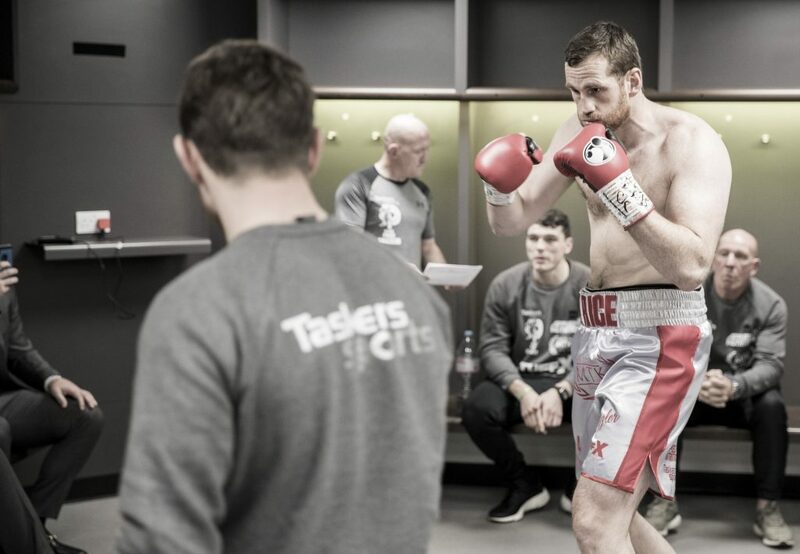 David Price is desperate to taste victory again after suffering back-to-back defeats against Russia’s Alexander Povetkin and Sergey Kuzmin. The Liverpudlian giant faces Tom Little on the undercard of Dillian Whyte’s highly-anticipated rematch with Derek Chisora this Saturday at The O2 in London, live on Sky Sports Box Office in the UK and DAZN in the US. This is potentially the last throw of the dice for Price after a difficult 2018 and the 2008 Olympic bronze medallist plans on taking out Little in style to set-up some huge Heavyweight contests next year. “I’m longing for that buzz of winning again,” said Price. “This is why Saturday is so important to me. I would love to get some momentum going and put together some good and see where it takes me, and then just go from there. 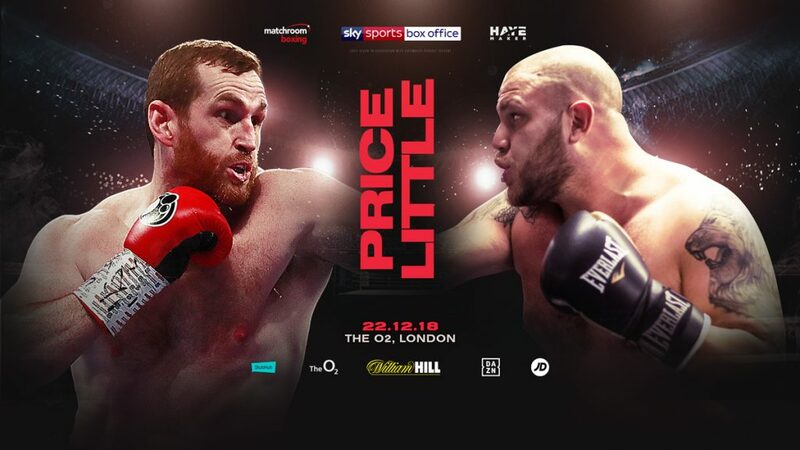 Price enters this weekend’s eight-round contest as a significant favourite but there’s no danger of him overlooking Little as he battles to keep his career breathing and he insists that the Hatfield man has his full respect. “This fight is of the utmost importance really,” added Price. “It’s a massive fight that I just can’t afford to lose. It’s everything. Tom is a lot better than his record suggests, put it that way, but I would consider myself a level above him considering I’m a former British Champion and an Olympian.